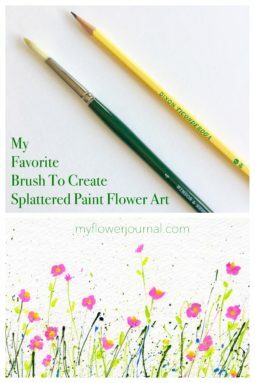 How to create splattered paint flower art continues to be my most popular post. 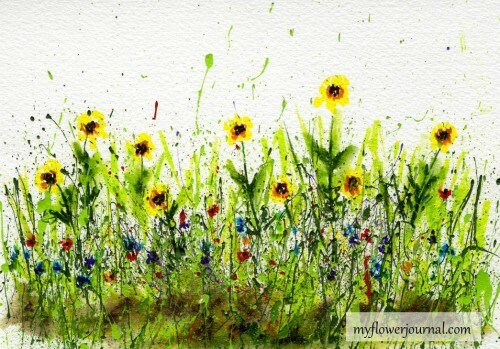 Over time many of you have asked great questions about how I create my splattered paint flower art. Here are some of the FAQ and my answers to help you with your own art. What kind of brush do I use? The Winsor Newton Lexington II Brush, Size 4 round is my first choice. I have tried lots of different brushes and this brush works the best for me. It needs to be a bristle brush that you would use with acrylics or oils. 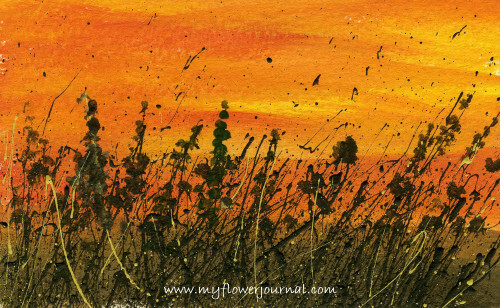 A soft brush, like a watercolor brush doesn’t splatter the acrylic paint as well. I photographed it next to a pencil so you could see the comparison in size. 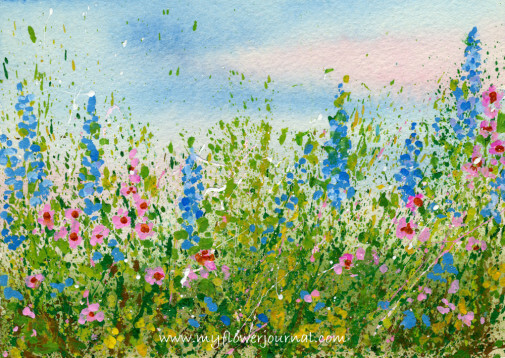 How do I create the long grass like splatters? I think the paint you choose makes the biggest difference. It does not work to use acrylic paint from a tube. Fluid acrylic paint works the best. If it is getting a little old and a little thick it won’t work as well. I have used a lot of different brands of fluid acrylic paints: inexpensive ones and the more expensive Golden Fluid Acrylics. I really like the Martha Stewart Satin Paints. They are good quality and work well on a variety of surfaces. I like to use intense colors I can mix with white to get different shades. The white in this brand is called Wedding Cake. The other colors I use are: Chamomile, Pollen, Marmalade, Habanero, Party Streamer, Plum, Purple Yam, Blue Violet, Rock Candy Blue, Peacock Feather, Green Curry, Green Olive, Seaweed, Chestnut Brown. They sell some sets on Amazon. 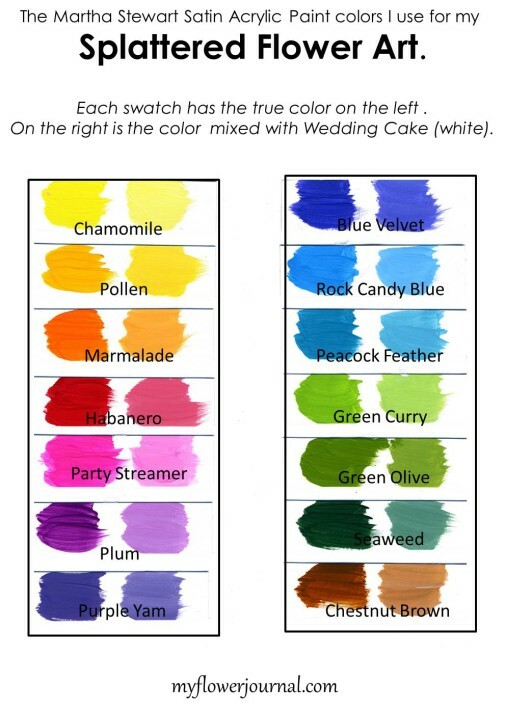 This set has lots of bright colors, including Party Streamer, Pollen, Habanero, Green Curry, Chestnut Brown, Wedding Cake and others that would work well for flower art if you don’t want to buy the separate colors. 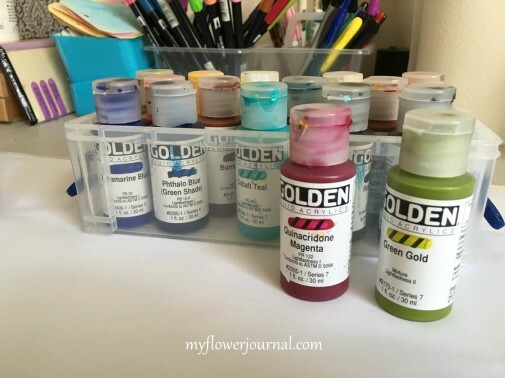 I love Golden Fluid Acrylic paints! They cost a little more, but come in such beautiful rich colors. Sometimes I use them combined with the Martha Stewart brand in the same painting. You might want to start with this basic set on Amazon and gradually add more colors. This set has one of my favorite flower colors: Quinacridone Magenta. You might want to get Green Gold for the grass/stem splatters. To see art I created with only Golden Fluid Acrylics go here. I had my daughter video me doing some paint splatters. It is a very short simple video (no sound), but will help you see how I splatter the paint. It also shows how I keep the splatters from getting all over my work area. I have some tips for easy clean up here . 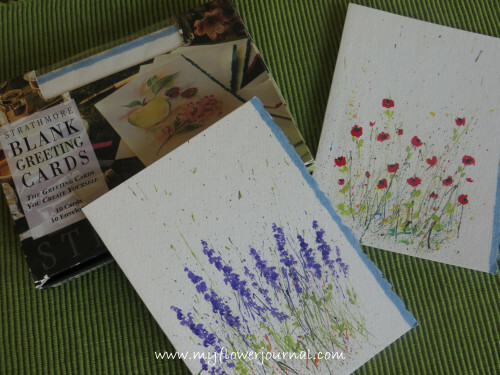 More spattered paint ideas and tips. 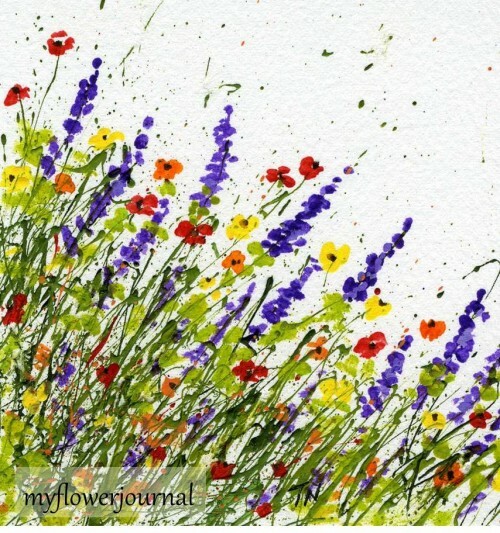 Watercolor flowers can also be added to splattered acrylic paint. Go here and here for more ideas. Take a look at all the great classes by Yoa Cheng on Creativebug! 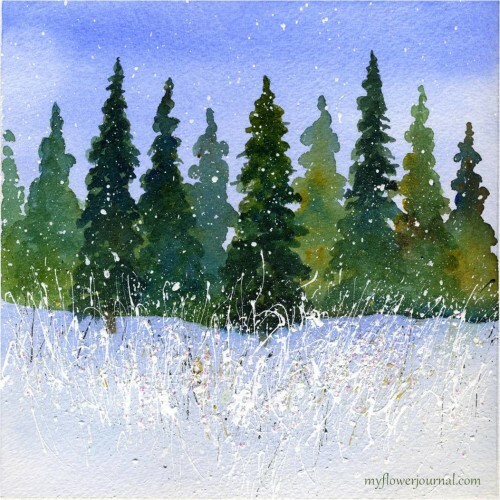 Wow Tammy–you are so talented. Those are all beautiful! I would just only like to say ,Thank you for your beautiful flowers. They are fantastic! Hey Tammy,could you post a video on how to create the long blue flowers? I can’t get them right!